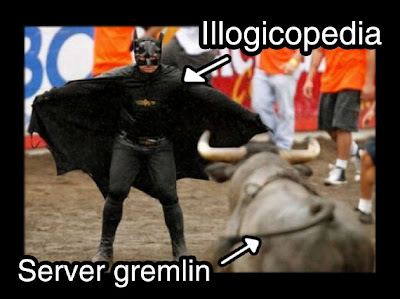 Illogiblog - The Illogicopedia weblog: Thoughts of the, er, year? Thoughts of the, er, year? In other, more relevant news, Uncyclopedia is now age restricted. For vague proof, see the below image, which (for a change) is in no way a propaganda Photoshop. You'll be pleased to know there are no such measures in place at Illogicopedia, so if you're under the age of 13, breathe a sigh of relief. However, in the unlikely event of us adopting restrictions at any point in the future, always carry an adult for when you decided to visit the site. Hey, I just noticed something. What happened to the Random Page link on the sidebar? I used to use that all the time. Meh. Anyway, it's time for me to go. My captors allow 1 hour of supervised internet access per day, and I have but minutes left. There's hardly time for me to check my pay-per-click account and spam the Spanish embassy site with rude messages, so I must flyyyyyyy!